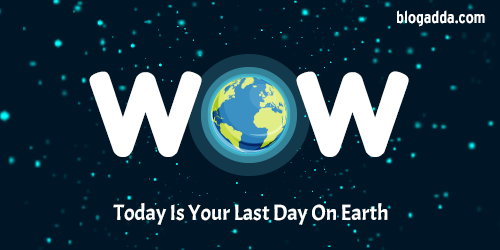 “Today is the last day of your life on Earth”. Wouldn’t the news be a shock, ending mirth? Today is the day I’ll enjoy; not grieve! I thought I’ll live long & life will be the same! ‘Today is my last day’- I’m helplessly thinking. I thought of my b'days & celebrations after my birth. From birth to death - has my journey been worth? Has my soul rejoiced? Has it fulfilled its mission? I was thinking all this near my final destination. Who will complete all the to-do lists? Any clue? I expressed through a note for my near & dear. Their value in my life then became clear! Thank you world for being such a nice place. Thank you God for your kindness & grace. On my last day, I made every second count & had fun. The next day, when I woke up, I earned my lesson! I pinched myself and felt happy as I was alive! Life has a purpose - celebrate, learn & thrive! The difference in my life-quality will be vast! Have you ever felt this way before? What if life ceases and we are 'no more'? Such a profound thought Anita. As rightly mentioned by you we are nothing but tourists. Yet we feel very much at home in this world! I can resonate with what you have written,nice poem. 'I'm a tourist on Earth and I have to go away'....All the problems start when we forget this. A good reminder. I so relate to the tendency to procrastinate, which I have raised to a fine art. And I KNOW I should be accomplishing this To Do list. I certainly related to your poem. So nice to see you, Anita. Beautiful post. Makes me want to count my blessings and spread love around. Congratulations on the WOW badge. Beautiful post Anita, and what a thought process.